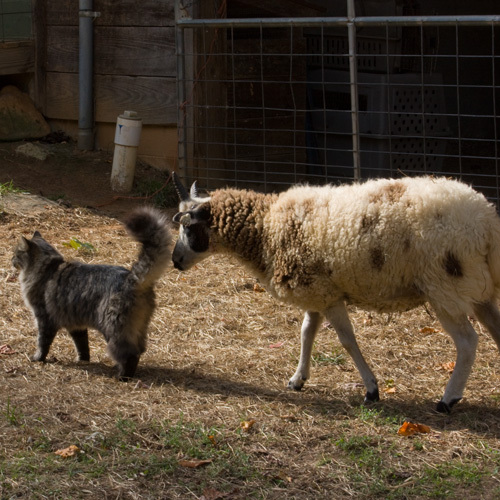 FarmGirl’s Eloise arrived yesterday and got acquainted with the various farm animals today. Sam was first. 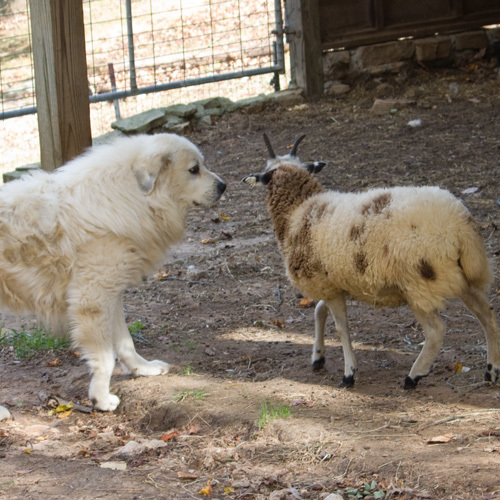 I’m always surprised when new sheep accept the presence of a great big dog with no fuss. Charles doesn’t love everyone. He’s just moving into his attack position here. One of the cats from the log barn came over to ask me about dinner. 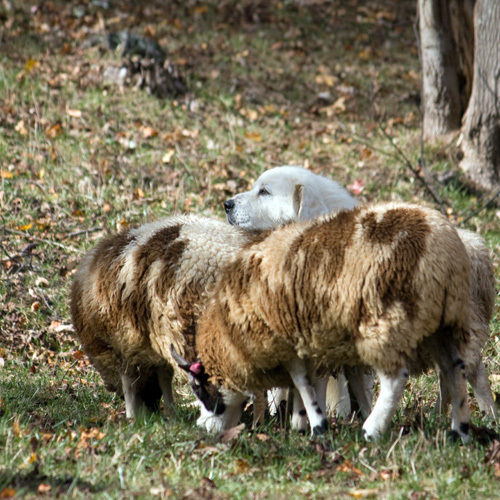 The red barn, along with the dog, the sheep, and any persons that he is able to catch, belong to Charles and only Charles. 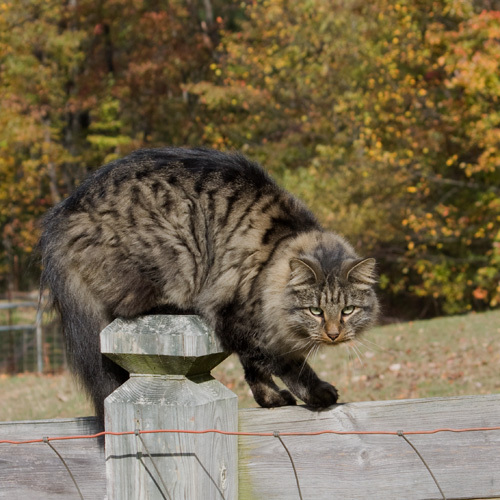 He takes very good care of his charges and tolerates no interference from those log barn cats! Cats have a well defined sense of the order of the world. Just ask any cat! Everyone acquainted and enjoying a beautiful fall day. 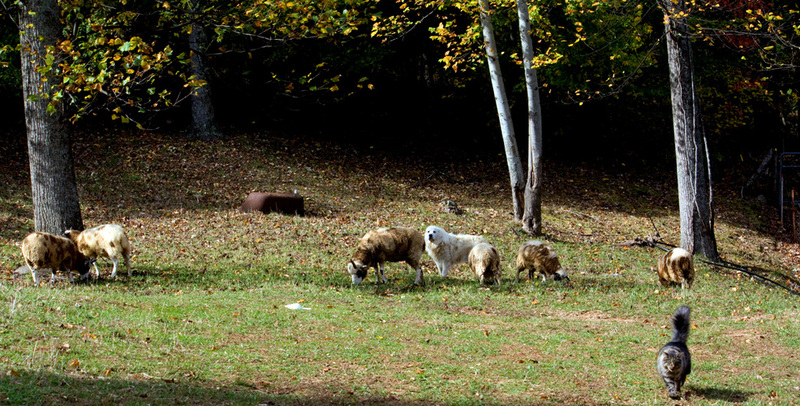 4 Responses to Getting Acquainted..
Eloise is with four other ewe lambs and my old RubyBelle (15). I sometimes breed ewe lambs, but the 16 adult ewes I have is enough for this year. Eloise looks quite calm and at home already! Is she in with other ewe lambs or a breeding group?